Priest: Zeus, king of the gods of the Greeks, brighten the ashes that I may read the future. I see... a great tree at the end of the world. And in its branches there hang the skull and skin of a ram. They gleam and shine for it is a prize of the gods, a Golden Fleece. Q: What is an Argonaut? Q: Why does the movie end so abruptly? Q: Why was Hera only allowed to help Jason five times, and what did she do each of these times? Hero Jason leads a team of intrepid adventurers in a perilous quest for the legendary Golden Fleece which has amazing healing powers. Jason sails on the Argo-ship to the land of Colchis seeking for the golden fleece in this mythological romp . 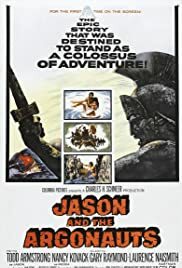 This is one of the best sword and sandals film from the history , retelling the legend of Jason in search of the famous fleece for uncharted sea . The film deals with the myth Jason (Todd Armstrong), son of king of Thesaly , the young prince has had his heritage usurped by his nasty uncle Pelias (Douglas Wilmer) who has taken the throne . He travels in search for the fabled Golden fleece located in the Colchis where is guarded by seven-headed hydra . It's based on a poem of Greek poet named Apolonio of Rodas titled ¨The Argonautika¨ (250 B.C) . In order to achieve his throne, Jason must retrieve the magical calf housed from distant land of Colchis and bring it toward city of Iolco . Jason assembles a motley , brave crew formed by a valiant band as Hercules (Nigel Green) , Polydeuces (Crawford) , the traitor Acastus (Gary Raymond) ,Castor and others ; meanwhile , evil Pelias has usurped the kingdom and taken his throne . Jason successfully leads his crew of would-be heroes throughout a series of outstanding adventures . The Argo crew are under the protection of Hera (Honor Blackman) , queen of the gods . They're confronted by a heinous giant bronze named Talos at an island and many other dangers . Jason saves Medea (Nancy Kovack) , priestess of Hecate (who later to be revenged Jason , killing their sons) from waters and both of them go to Colchis . They sail unharmed along sea storm , suffering thirsty , famine and incredible adventures , encountering giant monsters , multitudes of mythological monsters and weird creatures . This exciting picture contains lots of action, magic , fast-moving , thrills , impressive fights against monsters and lots of fun . It is an exciting fantasy-adventure full of special effects created by means of stop-motion technique by the magician Ray Harryhausen , the Dynamation man . The previous Ray Harryhausen films were generally shown as part of a double feature in "B" theatres , Columbia and the producer Charles H Schneer were able to book this film as a single feature in many "A" theatres in the United States. This time the large list of monsters result to be the following : a huge moving sculpture of Talos , as they battle against harpies , a venomous creature as hydra, and an animated terrifying skeleton army, all brought to life by the special effects masterfully created by the maestro wizardry Ray Harryhausen who regards this as his best film. In the ¨7th voyage of Sinbad¨ , Ray designed a sword-battling skeleton , here we see a whole army of them for Jason and his crew to fight at the ending of the film . It took Ray Harryhausen four months to produce the skeleton scene, a massive amount of time for a scene which lasts, at the most, three minutes . The runtime is adequate with various incidents and sub-plots . Harryhausen works his animation magic around a passable-developed screenplay and engaging acting by the entire performers . The cast is enjoyable with effective but unknown main actors , though important secondary Brit actors as Laurence Naismith (Argo), Niall McGinnis (Zeus) , Honor Blackman (Hera) , Michael Gwinn (Hermes) , Jack Gwillin (Aetes) . As usual in Sword and Sandal films here appears the choreographic girls dancing and lots of action with several adventures including spectacular fights , storms , witchery, and some good effects . This elaborate recounting was well directed by Don Chaffey although with little relation with the poem by Apolonio of Rodas . The film contains an evocative and powerful musical score by Bernard Herrmann conducting the Royal Philharmonic Orchestra . Colorful and spectacular cinematography by the great Wilkie Cooper . Fun for the whole family though it tends toward the ponderous at times but for the most part , it's a marvelous and entertaining movie . Other adaptations about this classic story are the following : ¨Giant of Tessaly¨ by Riccardo Freda with Ronald Carey and Massimo Giroti , ¨Hercules¨ by Pietro Francisci with Steve Reeves , Sylva Koscina and for TV ¨Jason and the Argonauts¨(2000) by Nick Willing with Jason London , Frank Langella and Olivia Williams .